It's useful to remember the simple things. Certain dishes are impressive feats, like bubbling homemade lasagna or triple-layer cakes, but there's also something to be said for the ingredients that anchor a recipe. Take mirepoix, the humble blend of carrots, celery and onion that serves as a flavor base for soups and braises, or the potato that makes its home firmly on the plate as juices from a roasted duck slide into its crevices. Today, celery root. Its skin is craggy, tough, and dusted with dirt from being pulled up from the ground. It takes some wrangling to cut off the outer layer, but once you reach the inside, its flesh permeates with the subtle scent of celery that adds complexity to whatever it's paired with. 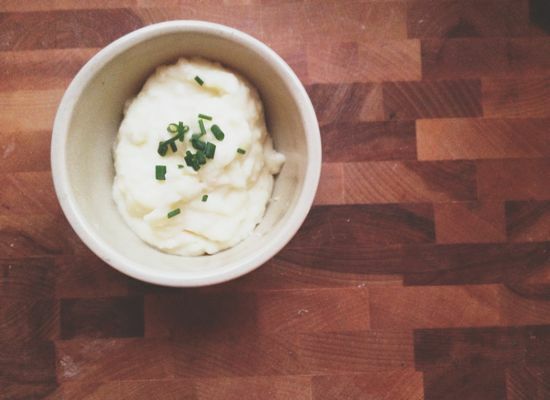 I've been making a version of this puree for several years now. It goes well under juicy roast chicken and braised short ribs, especially. To dress it up, you could add some toasted, herbed breadcrumbs and pop it in the oven for more of a gratin presentation, but it doesn't mind simply being spread on the base of a plate, holding up the rest of the meal.